Hello everyone! So happy to be blogging for the third day in a row! Woo Hoo!!! After my lengthy vacation from blogging, I wasn't sure I could still do it but it's just one day at a time. For sure, I will never run out of things to say or things to show you! While I was visiting my daughter a couple weeks ago we had a couple of the neighbor ladies come over for some papercrafting time. I had prepared the card above for them to make and they loved it (as do I)! These cards have been running around on Pinterest and I'm not really sure where I got the idea but I am thinking it might be Frenchie at Stamp & Scrap with Frenchie. Then I discovered I had put the card together upside down! After all the cards I've made you'd think that wouldn't happen...but it did!!! Sooo, how did I fix it? 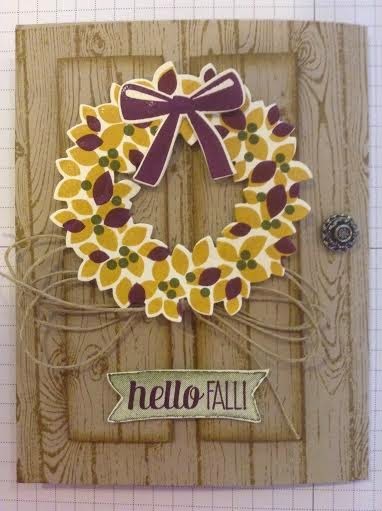 I cut the front of the card from the back, trimmed top, bottom and sides so it would measure 5 1/4" x 4" and mounted it onto a Blackberry Bliss card base and it took the card from pretty to WOW!!! LOVE IT!!! It is so much prettier in person, trust me! I have plans to make at least six more just like it! Hey, to celebrate my return to blogging, would you like the chance to win a set of 4 cards like the ones above (complete with envelopes)? I will leave the inside blank so you can use them for any occasion! Just leave a comment below telling me which card you like best and I will draw the lucky name on Sunday, October 12 at noon (PDT)! This drawing will be open to anyone in the United States and Canada! I just might have a couple more cards to show you tomorrow sooo, see you then! Certainly! I do like this one, Kat. Thank you William and you are entered in the drawing...hey, you might be the only one! I couldn't even tell the first one was upside down! I do like the blackberry bliss base though, it adds a certain pizzazz to it! Welcome back! It totally opened the wrong way:( Couldn't believe I did that! Thanks, Margarita! Oh I love your wreath. Glad your back to blogging. 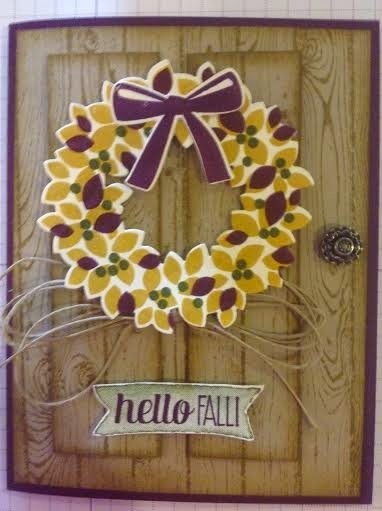 I'd love you to link your Fabulous Wreath at the Fabulous Fall linky party! Come and join the party! Thank you! I am so happy to be blogging again!